The green synthesis of nanoparticles allows for obtaining nanomaterials using plant extracts, avoiding the use of toxic and dangerous chemical compounds. The aim of this study was to evaluate the effect of phenolic compounds in plant extracts on the synthesis of iron oxide nanoparticles (FexOy-NPs) with photocatalytic activity. Accordingly, the phenolic content in 11 plant extracts was evaluated by the Folin–Ciocalteu (F–C) method, and the iron-reducing capacity was evaluated by the ferric-reducing antioxidant power method (FRAP). From the F–C and FRAP analyses, the Luma apiculata (LAL), Phragmites australis (PAL) and Eucalyptus globulus (EGL) extracts were selected and analyzed by HPLC coupled with a diode array detector (DAD) to identify and quantify the phenolic compounds. Using the three selected extracts, FexOy-NPs were synthesized, which were then characterized by UV–Vis spectroscopy, FTIR, DLS, zeta potential, SEM-EDX, and Raman and diffuse reflectance spectroscopy. The SEM-EDX, DLS and zeta potential analyses showed that the FexOy-NPs were spherical, stable and nanosized. The FRAP, F–C and FTIR analyses indicated the role of phenolic compounds in the formation and stabilization of FexOy-NPs. It was possible to establish a direct relationship between the composition of the phenolic compounds and the reducing capacity of the extracts. In addition, it was found that phenolic compounds and their concentrations are associated with the size and type of FexOy-NPs obtained. Furthermore, it was proposed that types of phenolic compounds influence the formation of different phases of FexOy-NPs. The photocatalytic activity of the FexOy-NPs was demonstrated by diffuse reflectance spectroscopy and decolorization of a dye under visible radiation. This research was supported by CONICYT/FONDAP/15130015. Pablo Salgado would like to thank Project CONICYT FONDECYT/Postdoctorado 3180566. 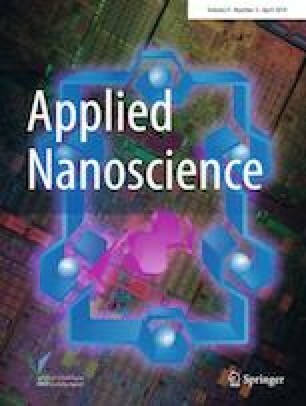 The authors would like to thank the Centro de Microscopía Avanzada, CMA BIO–BIO Proyecto CONICYT PIA ECM-12; Interdisciplinary Group of Advanced Nanocomposites of the School of Engineering, University of Concepción and its Project CONICYT FONDEQUIP/EQM 150139; Project CONICYT FONDEQUIP/EQM 140088; and the Laboratory of Organic Environmental Chemistry for its spectroscope of diffuse reflectance.